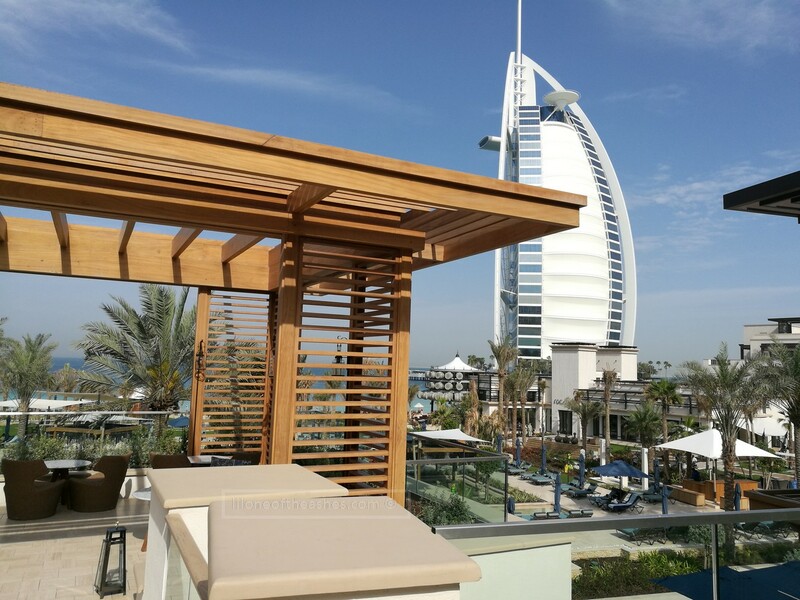 Ever since Jumeirah Al Naseem opened its doors to the public in December, I’ve always wanted to go check it out ….. and as I do, I waited to see if there would be any deals. They never joined the Entertainer (will they? ), and I couldn’t wait anymore (wanted to take mum there) – so I thought the 20% the Isme Elite membership gave would be good enough, gave them a call to see which restaurants serve breakfast. We drove up on a schoolday, and valeted. What a beautiful property, with a full view of the Burj al Arab through floor to ceiling windows as you walk in. We walked straight to Al Mandhar, through to the outdoor terrace to find a comfortable couch and found some old shabby looking ones on one side. Odd. Were these leftovers from the other property? Maybe they were still waiting for the new ones to come in? I then went over to the other side and found new, nicer ones. All this while, there was no one to serve us. Odd. A flip through the menu gave the usual sandwiches and finger food. I couldn’t find anything for breakfast and when asked, she explained that they could make us eggs upon request. So we did. Eggs Benedict, which she later confirmed to be just 50 AED. That’s a pretty good price. Cheaper than the Hamptons Cafe or Gourmet by Kcal. Hmm. Then I saw the price of a cup of latte. 40 AED. Omg. Fourty frikin’ dirhams. It better be worth it. When mum’s latte arrived, and she took a sip – and said it was good. Still so hot as though they literally made it at the door and walked out. My cappuccino arrived and wa-lah, I took so many photos of it as it was sure a piece of art. Hello to the barista who prepped it, you have some serious coffee-art skills. I just might forgive the resort for charging us 40AED for this 😉 Gotta mention that both coffees came with a glass of water as well. Mum’s club sandwich arrived, a very unimpressive plate of 65 AED worth of chicken breast, fried egg and turkey bacon sandwiches served with green salad and fries. Zero points for presentation – sorry – even I can do better, and yes – it was average tasting at best. Maybe the coffee person should’ve presented these sandwiches. Breakfast for two, after a 20% Isme Elite discount came up to AED156. Thanks for taking care of us – the property is so beautiful, we’ll be back to try out the other eateries very soon. Cheers to Isme Elite for making it slightly less painful on the wallet to eat here as well. C’mon, introduce a 241 for your afternoon tea already! And oh yeah, someone do something about that couch. It shouldn’t be in a newly opened property like yours! PS – They have an a-ma-zing toilet. Go check it out!